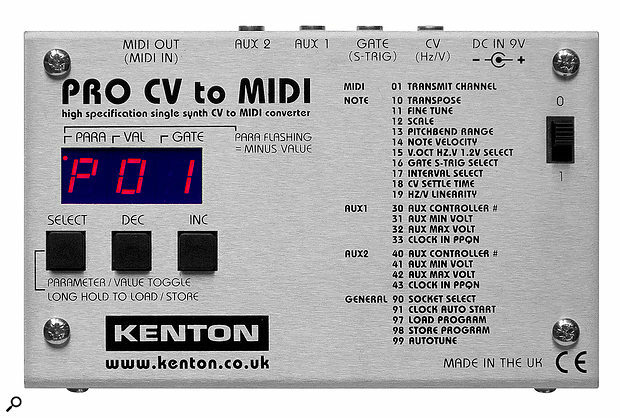 Even though it first saw the light of day in the early 1980s, MIDI is a protocol that shows no sign of fading away, and for those of us who depend on it, it’s an ongoing relief that companies such as Kenton exist — and can still surprise us now and again. One such surprise is that it’s the 21st Century and Kenton have devised another new MIDI thru box! What’s perhaps even more amazing is that, despite thinking I’d never need such a thing, I almost immediately began a project where I did. Over the last decade or so, MIDI has started to become an arcane art, with several of its important characteristics unclear to many. Often dropped to save a few quid, the once‑ubiquitous thru port gave us quick and painless chains of MIDI instruments, each tuned to specific channels. Providing you didn’t have a MIDI cable chain like the Midgard Serpent or some dodgy software thru to contend with, it worked well enough. However, as we head inexorably towards Ragnarök, we frequently encounter gear that can’t pass MIDI data around smoothly, if at all. For distributing clock around a system, a thru box is invaluable, and this one can deliver a dozen perfect copies of the MIDI input. I’m not sure how often you’d want to send 12 simultaneous copies of a large system exclusive dump, but Kenton offer a means of doing that. 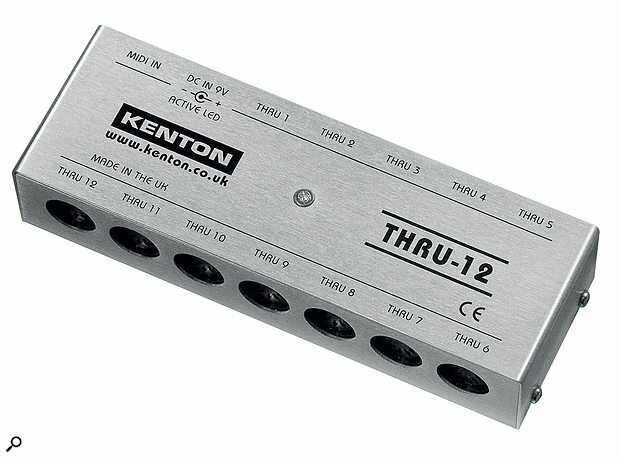 In more practical terms, the Thru‑12 is ideal for routing that neglected but useful format, MIDI Time Code (MTC). Examples of this might be from a Sequentix Cirklon to a DAW or amongst venerable beasties such as Roland’s VS range of hard‑disk recorders. Probably for most users it will simply be a bullet‑proof means of attaching several synths, drum machines and effect units to a common MIDI port. Modern marvels such as the Waldorf Blofeld, Moog Mother‑32 and Korg’s Volcas are all thru‑deficient and by no means unusual in that respect. With a Thru‑12 they could all live happily together on a single MIDI port. Kenton’s Pro CV to MIDI is another box you might not have anticipated, with convention suggesting that the opposite direction is more likely. But with so much voltage control now in circulation, it’s often MIDI rather than CV synths that appear shackled to old technology. To ensure your five‑pin favourites aren’t left out of the party, the Pro CV to MIDI (PCM) translates the pitch, gate and two other voltages from your chosen analogue source and converts them to MIDI data — no mean feat in some cases. The module is a solid silver metal box some 122 x 75mm on its rubber feet. It’s accompanied by a small external power supply and features inputs for pitch, gate and two ‘auxiliary’ signals, plus a single MIDI socket acting as an output. (Actually, this is also capable of being an input in the special case of updating its own firmware.) The PCM features a high‑specification 16‑bit A‑D converter (and tuning reference) for the main CV input, with the others a perfectly respectable 12‑bit. With 32 configuration memories, you can set the two aux inputs to be translated to multiple types of MIDI data. Having specified the minimum and maximum expected voltages (from between 0 and 10 V), you can choose a desired output from a list that includes clock, clock start, aftertouch, velocity and pitch bend plus, of course, MIDI CCs. The latter even includes the high‑resolution type found on a small selection of synths and implemented by combining two seven‑bit CCs. The aux inputs treat any negative voltages as zero, so to use the full range of modular LFOs (which are typically ‑5V to +5V) you’ll need a CV mixer module to add +5V to the LFO’s output. For the pitch input, it’s a little simpler. You merely need to specify whether the incoming notes are scaled for 1V/oct, Hz/V or the 1.2V/oct used by most Buchla synths. The pitch input can handle negative voltages and is capable of delivering the full range of MIDI Notes in the V/oct scaling, and over eight octaves for Hz/V. There are a number of ways to define note delivery. Semitones is the friendliest and therefore the default, but there are a couple of alternatives that employ pitch bend to reproduce the kind of seamless transitions taken for granted in the land of pure voltage. One of these (A440 mode) uses just a single MIDI Note. To obtain the full range, your synth is expected to handle four octaves of up/down bending, which isn’t too common. Fortunately, if you don’t mind a narrower span, the technique can also be applied to synths whose maximum pitch bend range is an octave up and down. Naturally, the gate input can accommodate regular gate (V‑Trig) or the inverted type (S‑Trig). Right now what you can’t do is repurpose either the CV or gate inputs for roles other than note generation. Personally, I often use the CV inputs of my DSI Pro2 synth to route modular envelopes (with sweeter decay curves than the Pro2’s own) to various parameters of the synth. Since few of my MIDI synths have CV inputs, I’d have loved the option to turn all the PCM inputs into controller streams, for similar purposes. It doesn’t take long to master navigation and editing via the three‑character display, and the text printed on the front means you should rarely need to dip into the manual. Although there’s quite a long list of options (eg. a choice of ppqn when translating an incoming LFO into MIDI Clock), text scrolls helpfully across the display to clarify even the deeper stuff. The very last menu item is Auto Tune, which sets up the scale, signal type and tuning parameters for you. All you need do is input a series of notes from a CV/gate keyboard. From this it works everything out, providing accurate tuning with the minimum of fuss, regardless of how old and creaky your CV keyboard might be. A ‘settle time’ parameter gives the PCM a means of coping with CVs that aren’t sent as quickly as the gate signal, or which take a few milliseconds to stabilise. Kenton inform me that the next firmware update will be able to measure the settle time within the Auto Tune process, thus setting the value automatically. Further plans include adding an ‘auto‑range’ for the aux inputs, a feature that will detect the minimum and maximum voltages without the user even needing to know them — rather useful given the diversity of Eurorack voltage sources. The PCM’s possible applications include: playing or sequencing any MIDI synth from one of your analogue favourites, syncing a MIDI drum machine or sequencer to a modular clock, or warping synths and effects units via exotic Eurorack modulation sources. Even the act of triggering a Korg Prophecy from an ARP Odyssey then layering the two provided me with several afternoons of noodling delight. The Pro CV to MIDI is a fun and unexpectedly useful metal box. Kenton do an admirable job of supplying solutions to the problems unique to this ageing but still vital protocol. Both the CV to MIDI and the MIDI Thru‑12 just work, and do so exactly as you’d wish. I can’t recommend them highly enough. MIDI Thru‑12 £109.80. Pro CV to MIDI £139.92. Prices include VAT. MIDI Thru‑12 £91.50 (about $120). Pro CV to MIDI £116 (about $150).